Last month, Christie’s Auctions and Private Sales experienced an unexpected internal rift as Chief Executive Steven Murphy stepped down from the position he has held since 2010. The New York Times reported on December 2, “in a swift move that surprised even auction house insiders, Christie’s announced that Mr. Murphy was stepping down. He will be succeeded by Patricia Barbizet, who has been chief executive of the Artemis Group,” of Murphy’s surprising resignation and subsequent replacement. The Artemis Group was founded by Francois Pinault, the owner of Christie’s, which suggests that executive level management of the auction house is being transferred into good hands. Still, the unexpected resignation of Murphy comes at an interesting time; just 12 days before Christie’s Chief Executive announced that he was stepping down, Sotheby’s Chief Executive, William F. Ruprecht, also announced that he would be resigning “by mutual consent” after 14 years in his role at the rival art auction house. 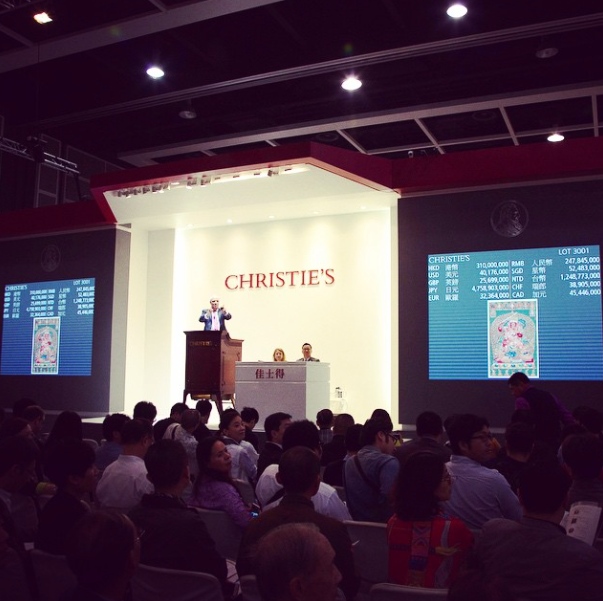 These incidents remind us that although art is the focal point of renowned auction houses like Christie’s and Sotheby’s, business is also at the forefront of these enterprises, perhaps even more so. Francis Bacon’s Three Studies of Lucian Freud. The last few years have certainly been tumultuous for both Sotheby’s and Christie’s, for reasons both good and bad. In May 2014, activist investor Daniel Loeb was appointed to Sotheby’s board of directors, a move that many art and business insiders speculate forced Ruprecht’s eventual resignation. Despite the change in leadership, Forbes reports that “Sotheby’s shares surged over 7% in after-hours trading Thursday on its announcement of a pending CEO change,” suggesting that not all change is bad, especially in the art world. Only time will tell what 2015 holds for Christie’s and Sotheby’s, but for now it seems that both art auction houses are thriving at the intersection of fine art and big business.